I am happy and excited to welcome Mary Lydon Simonsen, author of the newly released A Wife for Mr. Darcy, back to Psychotic State Book Reviews today to discuss her newest release, what Austen hero tops her list and how she pens those wonderful variations. Hi Mary! Welcome back to Psychotic State Book Reviews! I appreciate you being brave enough to come back for more chatting. MLS: Thanks, Lori. It’s always a pleasure to visit with you. You have a new book out - - A Wife for Mr. Darcy. This is your second reworking on the Darcy and Lizzy love story. What is it about them and their story that draws you in? MLS: That’s easy: the main protagonists. I love Elizabeth Bennet’s personality, especially her confidence and sense of self-worth. At the time of Darcy’s first proposal, he was not worthy of her love, and so she refused him. That took courage. As for Mr. Darcy, who doesn’t like a man that has all his attributes, as well as being handsome and rich, and is capable of change? He probably even asks for directions. You have tackled Pride and Prejudice and Persuasion. Any chance you will take on another work of Jane Austen’s? MLS: I already have. I have written a short story parody of Sense and Sensibility: Elinor and Edward’s Plans for Lucy Steele (available for .99 on Nook and Kindle). In this short story, the two lovers plot how to get Lucy to break her engagement to Edward. I also have an Emma parody running around in my head. Thank you for asking. How does one go from a legal secretary to working in special education to well respected author? MLS: I did not go to college right out of high school. Instead, I went to work for a law firm and took college courses at night. After my kids went off to school, I wanted to go back to work, but be available to them, so I took a part-time job in the school they attended. When a position opened up in special ed, the principal offered it to me because he knew that both of my daughters had learning disabilities and that I had read a lot about how to help them. Given this opportunity, I was able to help others. As for being a well-respected author, ah, gee, thanks. I always wanted to write a novel, but the pieces didn’t fall into place until I was sidelined by knee surgery. I got bored and started to write something that had been swirling around in my head for years. How did you get started on your first novel? MLS: I had written a detailed family history about the town near Scranton, Pennsylvania where my parents grew up. It was a dirty coal-mining town and provided lots of interesting stories about my Irish ancestors. That history gave me an idea for my first novel, Searching for Pemberley. The main character, Maggie Joyce, was from this little town. Maggie eventually ended up in England right after World War II. When she learns that Austen may have based her characters on actual people, she sets out to find the real Mr. Darcy, and in doing so, finds her own. How do you successfully marry being a wife, a mother and a writer? MLS: Being a wife and writer is easy. My husband of thirty-five years, Paul, is an easy going fellow who encouraged me to write my first novel. We sit back-to-back in our home office and get along famously, especially since I make him lunch every day. I didn’t start writing until I was 55, but for some reason, it just comes. I have never had writer’s block. The mother part is a little more difficult. Because I work at home, I am accessible all the time, and that means that my older daughter and her two children (Kaelyn, 8, and Skyler, 6 months) will drop by at anytime. But I’ll be a writer forever; they will only be little for a short while. Do you have any unusual routines or idiosyncrasies when writing? What one “must have” item is a necessity for you when writing? MLS: A comfortable chair. I can write for hours at a time, and I really need a good chair. Writing can be a very lonely endeavor. How do you handle the solitude? MLS: I don’t have solitude. My husband and I share an office. My daughter, who lives at home, is in and out, and my daughter and grandkids visit almost every day. Since I grew up sharing a bedroom with five sisters, I learned early on how to get things done with lots of people around. What has been your own favorite work and why? MLS: I really enjoyed writing Anne Elliot, A New Beginning. Because it is a parody, I was completely liberated from the usual restraints imposed on a writer by the societal norms of the Regency Era. In this story, Anne pairs up with a street urchin in Bath to uncover Mr. Elliot’s dark secrets. Great fun! What inspires you to pick up the pen, so to speak, and put words to paper? MLS: I love working with Austen’s characters. Although Jane Austen gave us great stories, she left enough details out of her novels so that authors, like me, can take her beloved characters and put them in different situations. There are endless possibilities. MLS: Captain Wentworth (I like that he has a job), Darcy, Mr. Knightley, Henry Tilney, Charles Bingley, Colonel Brandon, Edward Ferrars and Edmund Bertram. And finally, what one word best describes A Wife for Mr. Darcy? Thank you so much, Mary, for returning to me and my readers and best of luck with A Wife for Mr. Darcy! MLS: Thank you for having me. This was fun. For more information on author Mary Lydon Simonsen, please visit her blog. To purchase A Wife for Mr. Darcy, please visit my Amazon store here. So, readers, here is a question for you. Do you agree with Mary's assessment of Captain Wentworth being the quintessential Austen hero? If not, who tops your list? Hi Lori. Thank you for having me on your blog. Mary, I was surprised that you put Wentworth ahead of Darcy. It's not that I think that a bad idea, it was simply surprising. I would have picked Wentworth his "love letter." He expresses himself better than some of the others on the list. I am also quite fond of Henry Tilney's sense of humor. Congratulations on your continued success. 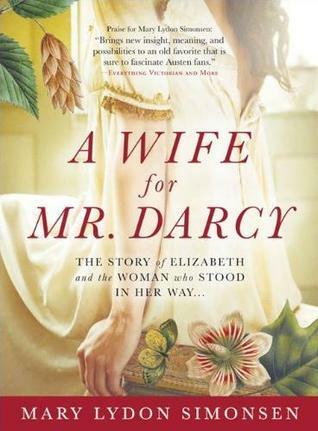 I'm so looking forward to reading a Wife for Mr. Darcy. I'm taking it on vacation with me. Thanks for the fun interview. Great interview! I think it's a tie between Mr. Darcy and Captain Wentworth, though I'd have to say that I think the good captain is probably a better real-life marriage prospect. Maybe it's just that Darcy is a little too good to be true. I do agree with Mary- I love Captain Wentworth! Congratulations on your new release too- I wish you every success!!! Another fabulous Austen novel from the amazing Mary Simonsen! What a great month this is! Keep it going, Mary. Great interview. I like that Wentworth is a self made man with a job too, but somehow I just can't get over my Darcy love! LOL! Thank you, all, for the posts. It's amazing what a great Austen inspired book will do! Mary has inspired me to pick up Persuasion again, at least at some point this summer if and when I get to a breaking point. I have always put Mr. Darcy first but there is something about a man waiting for so long to be with a woman again . . . sigh . . .
How nice to hear from my fellow Austen Authors. What a great bunch of ladies. To answer Regina, I love Darcy, but the fact that he never had to work for anything (other than Elizabeth's love) is a bit of a drawback for me. On the other hand, Wentworth is a self-made man, and as you said, "the letter." Oh, yes, the letter. I do love Capt. Wentworth; unfortunately, I suffer from severe sea sickness, and thus must rule him out! I'm sure you won't be surprised that I would choose Mr. Darcy. I am so much like Elizabeth in my sarcasm and vanity in my own sense and judgement that I can't resist the challenge he would pose on so many levels. I also love Mr. Knightley. And I would definitely put Edmund Bertram at the bottom of my list. I think he and Fanny Price may well be the dullest couple in all of literature! P.S. You do NOT look like a grandmother! You are such a marvelous writer that I can't wait to read your book. And I agree with the concensus of Wentworth, Darcy may be gorgeous but it would be hard to be married to someone that perfect. I don't know how my husband can stand it. A woman after my own heart - - I too do not know how my husband deals with the perfection. Hee! I also suffer from sea sickness so the thought of joining Captain Wentworth at sea is horrifying to me (although I still love his passion). And yes, Fannie and Edmund . . ummmm . . . I think MP is my least favorite Austen work. Bonnie, Not only do I get seasick, but I'm claustrophobic. I could never cut it. But once Frederick got home, I would entertain him royally. Karen, Darcy is on a pedestal. I like my men well grounded. Mary -- I loved what you said about the writing staying with you, but the children will grow up. I'll have to remember that the next time my 9-year old tells interrupts me in the middle of a crucial scene. Congratulations on the new novel. I'm sure it'll be as successful as the first. I enjoyed your interview very much. I just purchased A Wife for Mr. Darcy for my eReader last night and finished it this morning. Thanks, Mary, for many delightful hours spent with the usual P&P characters as well as your own OCs. Darcy is my favourite JA hero, followed closely by Wentworth. However, I don't think I could ever write from the latter's POV (despite having spent over 30 years with an former Navy man). Once again, congratulations on your latest release, Mary. I'm already looking forward to your next one. What a fun interview! :-) And huge congratulations on your novel release! Congratulations on your latest book, Mary! Lovely interview, too. And Mary, an Emma parody? Sounds delightful! Wonderful Q&A and congrats to Mary on your latest book! And, yes, Wentworth is quite a wonderful hero and one who embodies those qualities Austen seemed to prize highly ;). Mary, I absolutely love your sense of humor, which doesn't only shine through in your Austen parodies, by the way! Like you, I appreciate that Captain Wentworth has a job, but still have to rank Mr. Darcy as my favorite Austen hero, simply because of his quiet passion, and his willingness to put aside his arrogance and change his disposition in order to become a man Elizabeth Bennet could admire, even when he fully believed there was little chance he would ever see her again. Colonel Brandon would be next, followed by Henry Tilney. Best of luck on your new book! I'm itching to own it. I love all of Austen's heroes, but I think Darcy and Wentworth tie with me as favorites.